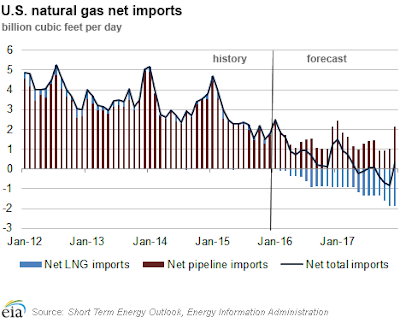 Today's BHI natural gas rig count was down six to 121, but over the past five months, the gas rig count has dropped by 90, or 43% from levels that were already record lows (at least since the BHI count was initiated in 1991). 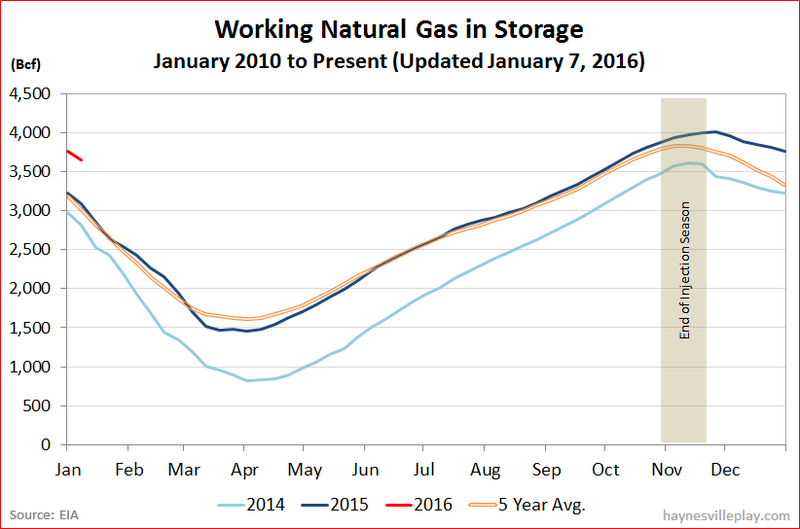 I know, I know, I told you I am not going to keep updating the site going forward, but I couldn't resist sharing the new year's working gas in storage chart. Track the light blue line (2014) go through the year as the polar vortex creates a big deficit in the spring and summer. That winter, prices spiked upwards but drifted back downwards during the year. 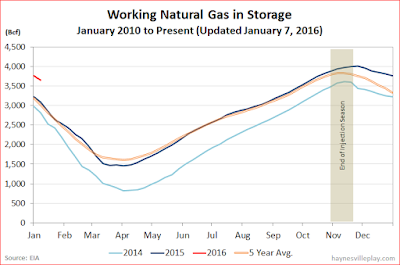 But as the year went along and the storage line eventually hits the gray bar signifying the end of the injection season in November, it hiccups and starts rising rapidly. Then go back to the left side as the light blue line becomes the dark blue line (2015). At this point, prices are dragging downward. The dark line tracks the five year average line (gold) until it hits the gray bar in November again and then drifts upwards as the injection season goes long with the warm end of year weather. Boom, we see the lowest gas prices in a couple of decades. Shift back to the left and see the red line (2016) now floating way above all of the other lines. Where it goes from here will be a major determinant of what happens to prices going forward. That's a succinct explanation of what has been going on with storage and how it directly relates to the change in prices over the past couple of years. 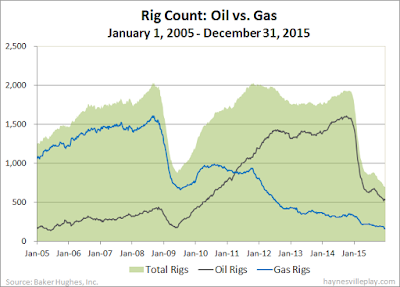 The Baker Hughes U.S. rig count was down two this week to 698. 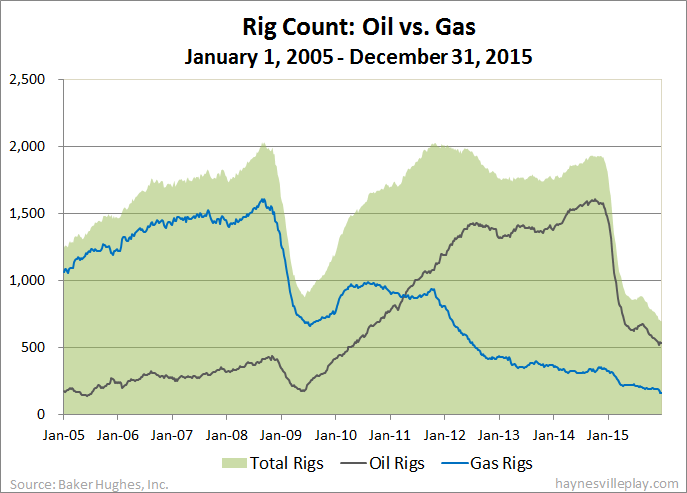 Oil rigs were down two to 536 while gas rigs were unchanged at 162. By type, horizontal rigs were down five to 549, vertical rigs were up three to 89 and directional rigs were unchanged at 60. Among gas rigs, horizontal rigs were down one to 128, directional rigs were up one to 22 and vertical rigs were unchanged at 12.